The latest report from Meden School confirms the success of the Community Minibus project, with bookings for the bus continuing to grow as the year has progressed. During the first six months of the project, the 15-seater minibus (pictured right) has been borrowed by a diverse range of groups of varying interests and ages including schools, church and sports groups, the Rotary Club, Beavers and Scouts, the Air Cadets, and organisations such as Jigsaw. 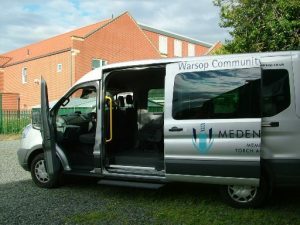 Meden School took delivery of the minibus in April, which was funded by a £35,000 investment from Big Warsop. The Community Bus project provides support for local community groups to allow them to participate in activities that may otherwise not happen due to cost or an inability for the groups to be able to reach an event. As well as community bookings, the bus has and continues to be used regularly by Meden School, which uses if for weekly sporting events, theatre visits and educational events. Further bookings for the bus have already been received for the new year and look set to build on the success of the project’s first six months. If your organisation or community group is interested in using the Community Bus, you can check its availability and book online through Meden School’s website at medenschool.co.uk. There is a nominal charge for using the bus to cover petrol and ongoing maintenance.